My students have been knee deep in multi-step fraction word problems for the past few weeks and I wanted to give them a little break from all of the heavy thinking, so I decided to do a little "Game Rotation" session with them! What is this, you ask? Well, let me tell you. I went through my game stash at home and found some games I thought my kids would like AND that I could add a little educational twist to. I will share those games below, and just what I did with each game too, but let me first run you through how I set the stations up. On 7 different tables, I placed on game station. I put the game out, placed any task cards there that were needed, and put any other materials that might be useful (like paper towels or wipes.) I then dismissed the students one by one to sit at a table. They could sit anywhere but only 4 students were allowed at any given table (only 28 of my students were participating, as the others were engaged in a separate activity.) 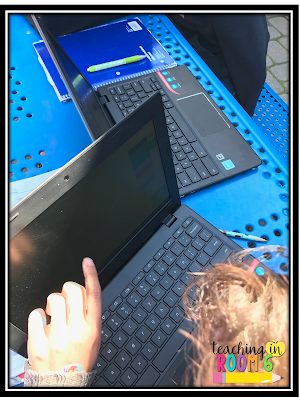 The students took their math notebooks and a pencil with them to the station. I gave the groups 10 minutes to play whatever game was in front of them. I had previously taken 15 minutes before recess to briefly explain each game. They were super simple and familiar, so the kids were good with that short explanation. I laid down some ground rules (i.e. : keep it fair, don't rush ahead, follow the rules, keep it semi clean, etc...) the kids were off. Here were the games we played. I actually had 3 stations of this game, since at my house I had 3 game boxes (I know, that is excessive for one household....) At each station, the game set up was there, a can of whipped cream, and a set of fraction task cards spanning all operations. The students each chose a task card I created that purposefully only had answers from 1-6 (which were harder to create that I thought they would be!) Once all 4 students had successfully solved the problem on their card, they took turns at the Pie Face wheel. The students turned the levers as many times as their answer told them too. If they were pied, I let them add more whipped cream so that the rest of the kids could have a turn. Needless to say, they LOVED this station. Since I had 3, I spaced them out so the kids would go through this station every other time we switched. So, this technically isn't a math game, but it does involve lots of logical thinking and deducing. 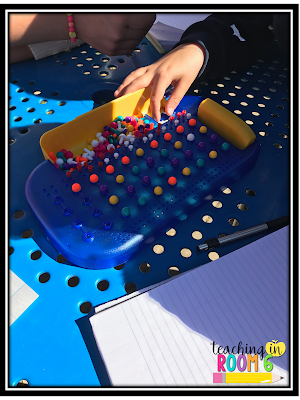 If you haven't played this game before, one group of students create a pattern with 4 different colored beads. 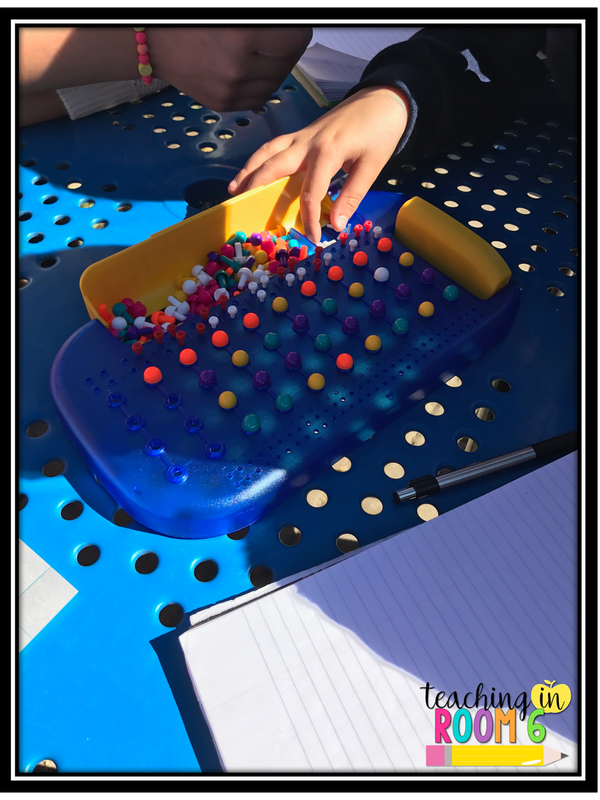 The other group of students needs to figure out the pattern using colored beads and clues from the first group. My kids were SUPER engaged with this one as it seems very easy but proves quite challenging once they actually play. I set up a chromebook station and the students played Prodigy on their own log in. They really enjoy this game, so it was quite relaxing for them to play. They did have their math notebooks with them so they could work out the problems on there. This is a game I found in my cupboard that I knew would work PERFECTLY for this rotation. I gave my kids a set of easy one step division problems (you could also use the fraction task cards from Pie Face to make things easier). 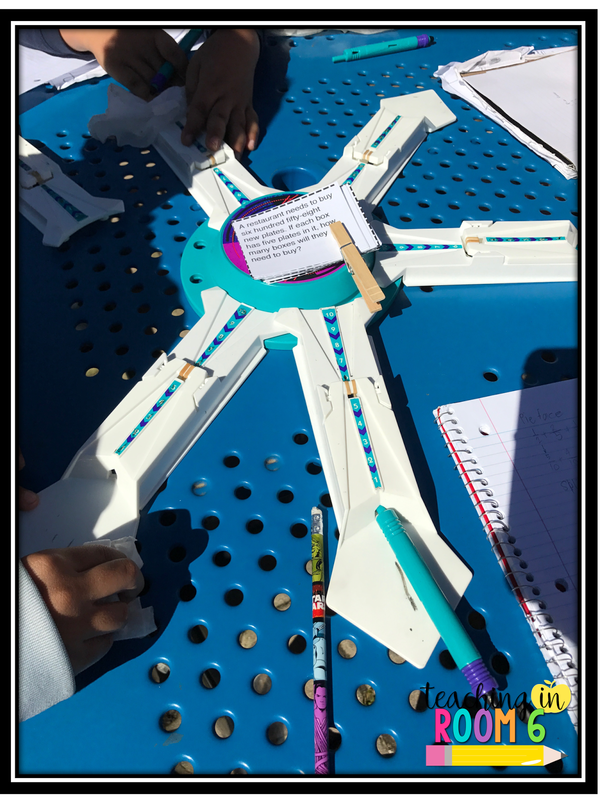 The entire group was to solve this one problem and then, when the individual student finished solving it, they let go of their paddle and it popped to the center. The first kid with the right answer who was closest to the center won that round. 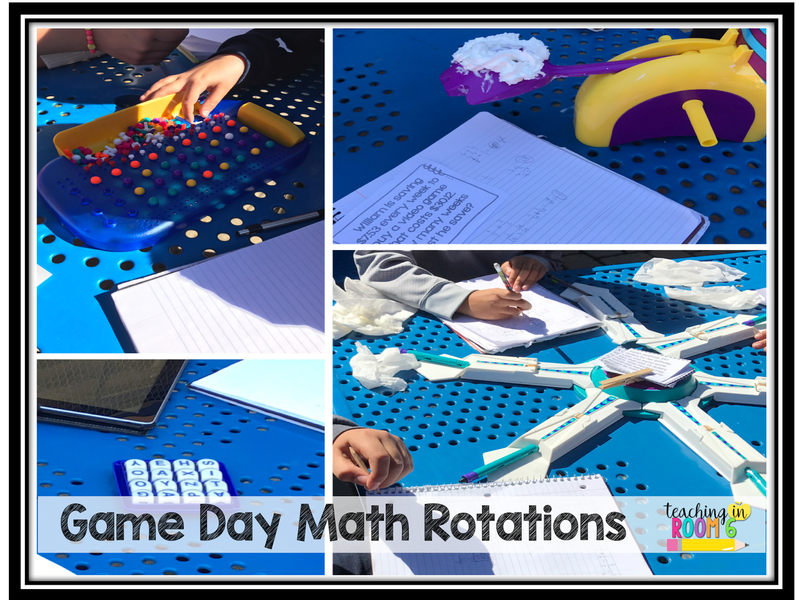 Ok...this REALLY isn't a math game, but I had it at home and I needed another station, and the kids like it....so I used it. :) I set out the iPad so they could time each round for 2 minutes. 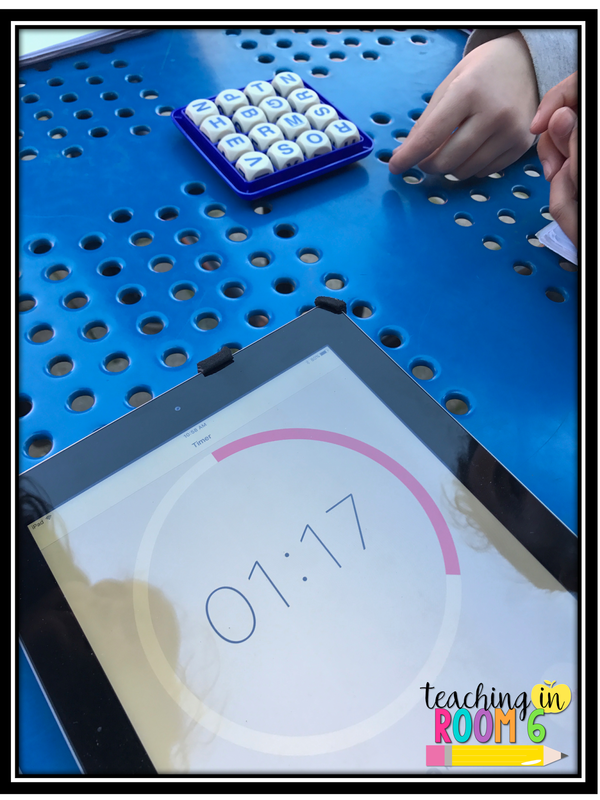 The kids shook up the Boggle board, set the timer, and started finding words. You would be surprised how many kids had never played this game before! But they really had a nice, challenging time finding words. In total, the kids only spent about 60 minutes going through the rotations (so they didn't get to every single one) but they really had a fantastic time. 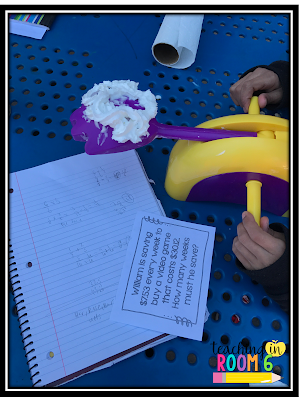 I loved that they were still engaged in math, but got to have a little fun while they were at it! Pie Face - that's brilliant :) Thanks for the ideas. We like to break things up a bit with a quiz on the whiteboard. There are some fun quiz templates ( eg uquizgames.com ) that make it easy to whip up a quiz with your own content. Great for maths!